A visit to Nepal, namely Kathmandu, was squeezed in at either end of a walking trip to Bhutan in 2018. Flying via Delhi we arrived with basically a full day to try and get some insight to the country. 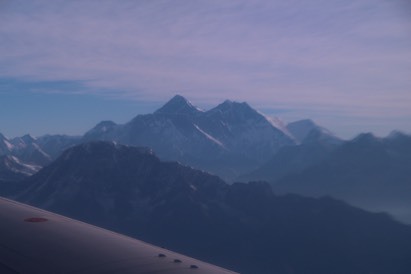 A very early morning wake-up call saw us at the Domestic terminal to check-in for a Himilayan sightseeing flight with Yeti Airways, the highlihght of which would hopefully be stunning views of Everest. Everything went to plan and we were soon peering out of the windows at the stunning scenery and then taking it in turns to go into the cockpit for a pilot’s eye view. Absolutely stunning and the weather was perfect. All too quickly the champagne was being poured and we were heading back to Kathmandu for breakfast. 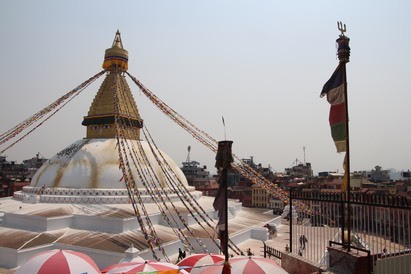 After a hearty breakfast we were picked up for a brief city tour which included this lovely stupa seen here from a restaurant terrace where we consumed delicious momos (dumplings) for lunch. 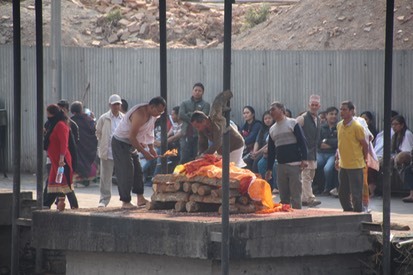 The next stop was the Unesco site in the centre of Kathmandu which included some nice temples and a traditional burial area where active cremations were to be seen in action.